This dress is a stunner and full of amazing details! It has an empire waist and a low neckline that is extremely figure flattering. 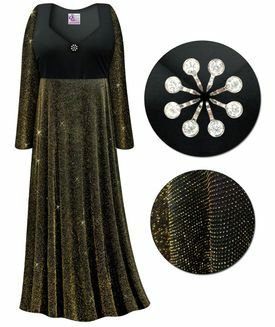 The black bodice is made of a lycra blend material in a black color while the skirt and sleeves are made of a gorgeous glimmer slinky fabric. A rhinestone circle in the center of the neckline adorns the black bodice, it measures about 7/8" in diameter. This fabric is a wonderful lightweight slinky fabric (with lots of stretch) & a breeze to take care of! Throw it in the washer, dryer, and straight into a drawer or suitcase, take it out days or weeks later, and it's ready to wear! Another thing that's great about these slinky fabrics, is they rarely wrinkle, so they travel great! They're very stretchy, and have a wonderful drape! Available in sizes Lg to 8x in customizable lengths. The standard length is 52".